Today we celebrate International Women's Day and would like to introduce you to Nun Maya. 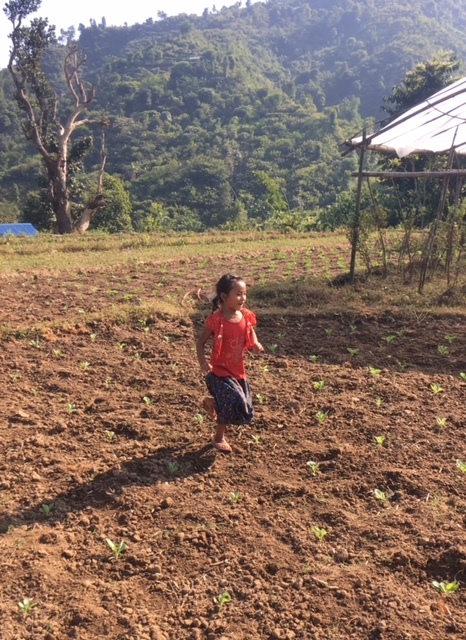 When we visited Deurali in November, we met Nun Maya and her two young children. They had just bought a simple water sprinkler with help from our local NGO partners HICODEF. It is all part of the climate change adaptation project TGT is funding there. TGT and HICODEF generally don’t go in for tech ‘solutions’; they often require power (and therefore fossil fuels) and farmers can run into trouble trying to service and maintain them. But low-tech, labour-saving and emission free bits of kit can make a big difference. Nun Maya told us that the sprinkler saves her around two hours a day. That adds up to 600+ hours a year, around 50 working days! Those extra 50 days will make an extraordinary difference; imagine if you were suddenly given two hours more a day?! Nun Maya is putting the hours saved to use developing and expanding her farm. HICODEF are training her in growing new crops and marketing them in the local town, she is already growing tomato, cauliflower, cabbage and peas. She hopes to become a commercial farmer and seems to be well on the way. Her first aim is to recoup the 20,000 rupee investment she has made in the irrigation equipment. After that, she wants to take on some staff to help during busy periods. As a lead farmer, Nun Maya is inspiring and motivating other women in Deurali. Watching her children's pure delight at running through the sprinkler water, she is no doubt inspiring the next generation too!